Michael O’Connor will be a centre of attention this season. The University of British Columbia quarterback is already getting a hard look this week in Quebec City as he prepares for the East-West Bowl, a game featuring Canadian university players who are eligible for the ’19 CFL draft. And given the six-foot-five, 230-pound Ottawa native spent time at a Tennessee prep school, then headed to the highly regarded IMG Academy in Florida before landing a scholarship at Penn State, he’s also expected to garner NFL interest this year. "He’s going to attract interest from both sides of the border, for sure," said UBC coach Blake Nill. "You’re talking about a player who has all the physical tools, the genetics and intellectual ability. "He’s a pro-style quarterback. He’s athletic and has the ability to run but I wouldn’t categorize him as a dual-threat. He’s tall enough to see, strong enough to make all the throws and definitely has the leadership capacity." O’Connor transferred to British Columbia in 2015 and promptly led the Thunderbirds to a Vanier Cup title. He was named the game MVP after completing 31-of-51 passes for 389 yards and a TD in a thrilling 26-23 victory over Montreal. 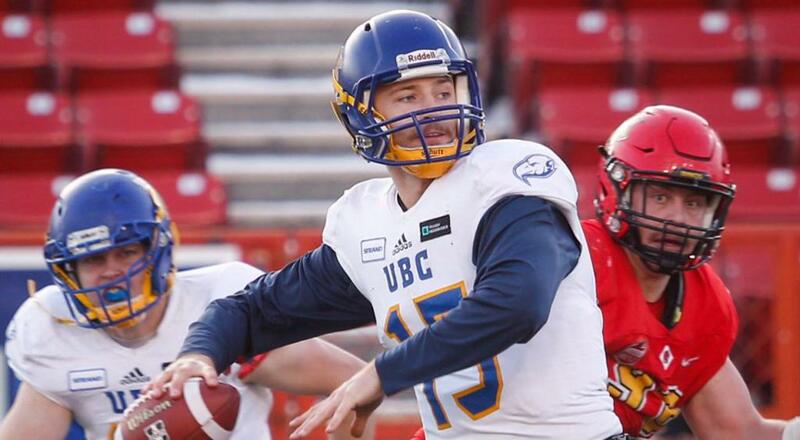 Last season, O’Connor was 183-of-271 passing (67.5 per cent) for 2,308 yards with 14 touchdowns and five interceptions in leading UBC to a 6-2 record. The Thunderbirds’ season ended with a heartbreaking 44-43 loss to Calgary in the Canada West final as O’Connor completed 26-of-37 passes for 357 yards and five TDs with two interceptions. "He has the makings of someone we’re going to be looking at pretty closely," said a CFL scout requesting anonymity. "In terms of size, he checks everything off there and while he’s not maybe Josh Allen (Buffalo Bills first-round pick) the arm strength is there to make all the throws on the big field. "What jumps out are his leadership traits and what he’s done for the (UBC) program since he got there and how he interacts with players on the field. He’s tough, too, he’ll take some big shots and get right back up. He has enough mobility that he can create and buy time and if it doesn’t work out he can get downfield and gain yards. There’s a lot there that you like and I think everyone will be watching him pretty closely." Canadian-born quarterbacks are a rarity in the CFL. Saskatchewan’s Brandon Bridge, a Mississauga, Ont., native, is the only one after Calgary native Andrew Buckley retired Monday after two seasons with the Calgary Stampeders to attend medical school. "I coached Andrew at Calgary and his path (to CFL) was totally different than Michael’s," Nill said. "Michael is someone who was initially U.S.-trained at the IMG Academy and then spent a year at Penn State on scholarship. "That gives him an advantage in that he’s played in and dealt with a different culture. Whether he’s pro ready when it comes time for that evaluation to be made has more do to, I think, more with what he’s done at UBC now. A big part of the equation is our strength-and-conditioning coach Joe McCullum, the coaches he’s worked with like long-time CFL coach Steve Burrato and the opportunity to work with (new UBC offensive co-ordinator) Stefan Ptasek in the next year." Jesse Palmer, also of Ottawa, was the last Canadian quarterback taken in the NFL draft, going in the fourth round of the ’01 draft by the New York Giants out of Florida. But Nill said O’Connor is much more than just an outstanding football player. "He’s a very driven young man," he said. "He has already graduated from the Sauder School of Business (at UBC), which is an incredible accomplishment for an athlete." O’Connor isn’t the only UBC player scheduled to play in the East-West game Saturday. Also on the West squad are defensive lineman Connor Griffins, defensive backs Malcolm Lee and Stavros Katsantonis as well as receiver Trivel Pinto. Having five East-West representatives returning in 2018 should give UBC a solid core of fourth-year players this season. "I’m hoping (O’Connor) and his class have a very solid encore experience this year," Nill said.